If you have ever wanted to see your aura, the fact is that you may be able to do so. 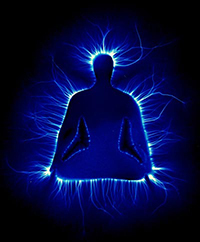 In a method called Kirlian photography (so named after Semyon Kirlian) it is possible to take a photograph of someone or something while it is on a photographic plate and subjected to a strong electric field, and actually get an image of the objects energy field, or aura. Indeed, believers in Kirlian photography’s validity will attest that the fact that energy fields are able to be photographed in such a manner is irrefutable proof of the existence of auras. Kirlian himself spent a good portion of his time promoting and pushing the idea that these photographs were able to prove beyond all doubt that every living object has an energy force or aura. In a famous experiment, Kirlian claimed that he cut a leaf in half and then photographed it using the Kirlian method. He stated that the resulting image was showed the energy field put off by half-leaf actually showed the leaf as still being whole, as though it had never been cut at all. According to Kirlian, this was proof of the aura of the leaf. After these claims were made, however, researchers as Drexel University were unable to reproduce the effect that Kirlian claimed to have gotten. According to them, the effect garnered by Kirlian could have been created due to a large number of variables such as the surface etching of the glass, moisture, and/or pressure on the leaf. 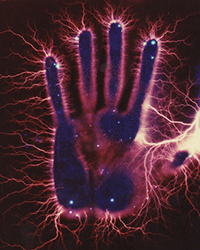 Despite the inability of scientists to reproduce the results of Kirlian’s experiment, many people still believe in the validity of his claims and his photography method. In fact, Kirlian photography has become the preferred method of most metaphysical practitioners to produce physical images of their customer’s auras. Because the aura is believed to be able to show areas of illness and spiritual, physical, and mental disorder in people, many believe that this small window that can be used to view the aura can be an invaluable tool. Surprisingly enough, inanimate objects also give off an aura when photographed using the Kirlian method. In fact, there are well documented cases of items such as rock and coins being photographed using the Kirlian method that showed distinctive auras. In the 1980’s a Polish scientist by the name of Wrona began applying Kirlian photography to the field of forensics. This technique is still used to some extent today. While the field of Kirlian photography is far from being universally accepted as providing irrefutable proof regarding the existence of auras, true believers will argue that some things are true whether you believe in them or not. If you are interested in having your own aura photographed, you may very well be able to find a Kirlian photographer in your area. Of course, be wary of people who want to charge excessive prices for their services, and check for customer reviews of any person or company you wish to do business with; but other than that, you will probably get really good results if you go with a reputable practitioner.